For an organization committed to promoting the welfare of real, live animals, PETA has been increasingly busy with virtual ones. Over the past few years, the group has launched several campaigns protesting everything from the clubbing of pixelated seals in World of Warcraft to Mario’s raccoon-like Tanooki suit, which made the beloved character even more adorable and endowed him with the gift of flight. PETA, however, was unmoved: The suit, the organization argued, was a body-length fur coat, and its prominent appearance in the game an endorsement of the real world fur trade. Now, the group is targeting a franchise even more prominent than Mario, arguing that Pokémon, the ubiquitous series of strategy games that saw its latest installment this week, encourages animal abuse. It is tempting, and not too difficult, to dismiss PETA’s effort as nothing more than a publicity stunt, and most of those who have covered the campaign have suggested, not altogether unwisely, that PETA focus on corporeal beasts rather than fantastic ones. But PETA has a point: The Pokémon games are marvelous, and far more nuanced than their exuberant, childish appeal would suggest, but they are also celebrations of the sort of spirit that moved men like Teddy Roosevelt and Ernest Hemingway to see animals as trophies to be collected, or equipment for sadistic sports. If you’re unfamiliar with the Pokémon series—which has, to date, produced 20 video games, 12 movies, a television series, cards games, and other peripherals that make the franchise worth around $25 billion—or if you have no children who speak of Pikachu and Charizard and Mewtwo as dear and present friends, the games involve seeking out fiery and expertly named creatures, seizing them, and then making them fight each other for the greater glory of their human captor. The battles themselves are never shown; players take turns deciding which attacks their Pokemon should inflict on rivals and await a report of the consequences. As could be expected from a game with such a problematic premise, one meets an abundance of characters whose sole purpose is to remind players that people and Pokémon are the bestest of friends and that all the fighting is in the mutual interest of both species and that there’s nothing remotely cruel about locking large animals in small Pokéballs (so small, in fact, that they are often stored in pockets) until they’re ready to come out and unleash their fury. But these characters do protest too much. It takes very little critical thinking to see that, at its core, Pokémon games are digital representations of a sport that is only a shade cuter than, say, dog-fighting. That the games choose to refrain from visually representing the carnage hardly matters; as the cardinal rule of dramaturgy goes, the audience never wants to see Medea slaughter her children, and the fact that the murders occur off-stage makes them all the more horrific. The same goes for Pokémon: a thousand graphically animated battles wouldn’t have been anywhere as horrific as the eerie, sterile sensation of choosing an attack, pressing a button, and waiting to learn what happens. PETA, unsurprisingly, missed this subtlety. 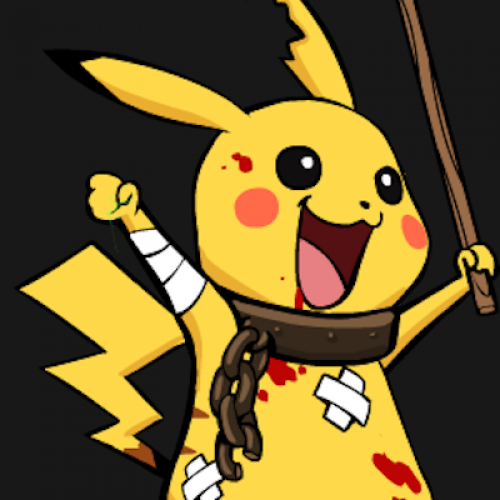 In its ads, the Pokémon are depicted covered in blood. But the most terrifying thing about the series is that, uncommonly for video games, not a drop of blood is visible. In many other games, players are required to kill and maim creatures of all stripes, the killing is visceral and interactive, and players are never desensitized to the violence as they partake in it too vividly and intimately to lose track of both its horrors and its splendors. This is why so many commentators have noted, rightly, that modern video games feel a lot like war. The Pokémon player, however, has a very different experience. He is like a drone operator, fighting from the safety of great distance. His hands are always clean, and his nerves never frayed. He comes to think of the creatures as abstractions, little more than pawn pieces to be moved in pursuit of a largely theoretical goal. And this, of course, is the real danger, not only when it comes to our real-life unethical treatment of animals, but to our unethical treatment of fellow human beings as well. Liel Leibovitz is a visiting assistant professor of communications at NYU, researching video games. He is also a senior writer for Tablet Magazine.